Well I have had my SpaceNavigator for over a week now (thank you NASA/3D Connexion), so its about time I reviewed it. 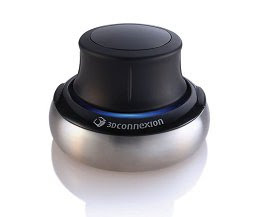 I’ll start with the basics, first off this wont replace your mouse, it is designed to be used along side it, application support is pretty good out of the box (with the latest drivers) with an emphasis on CAD and 3D design software, which of course it’s perfect for. It comes with a couple of demos, nothing fancy, a spinning cube which you can rotate and twist (they should turn that into a Rubik’s cube game, it would be highly addictive), a wireframe jet, a jack in the box and a tetris like block. Also worth note is the windows picture viewer replacement, which is an optional install, its pretty cool you can zoom in and out of pictures very smoothly. 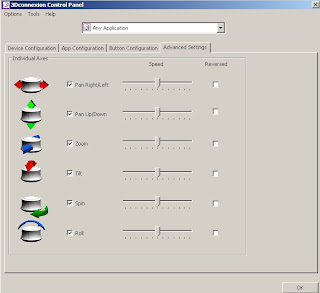 The driver control lets you change pretty much everything on the navigator, switch axis, navigation mode, button assignment, etc. turn the sensitivity up it really helps for most apps. Now for World Wind you currently need to install a plug-in, future versions of World Wind will likely have this built in, currently the plug-in is beta but they seem to be keen to finish it quickly, I’ve already had one update after I reported a bug to Chad, and the current plug-in seems much nicer and very stable. The World Wind plug-in lets you choose between two modes, move yourself mode (GE mode) and move the Earth (WW mode), currently this setting isn’t saved between sessions which is a minor annoyance, I’ve reported this to Chad though so I’m sure he’ll pass it on. I of course prefer WW mode, once I set this I found it great to control, you can zoom into valleys and pan around much more easily and smoothly than with a mouse, as they say a picture paints a thousand words I made a YouTube video, which at 20fps and 6 minutes 17 seconds long should be worth 7540000 words or so. Feel free to share or re-use the video there’s no copyright.